A few weeks ago the Bee asked me what a crystal was. It was a really simple question but for some reason I had the hardest time explaining what a crystal was. So I did what all good moms do when they can't come up with an answer, I consulted Google. In the search results was some directions for growing your own crystals using Borax. So we gave it a shot. 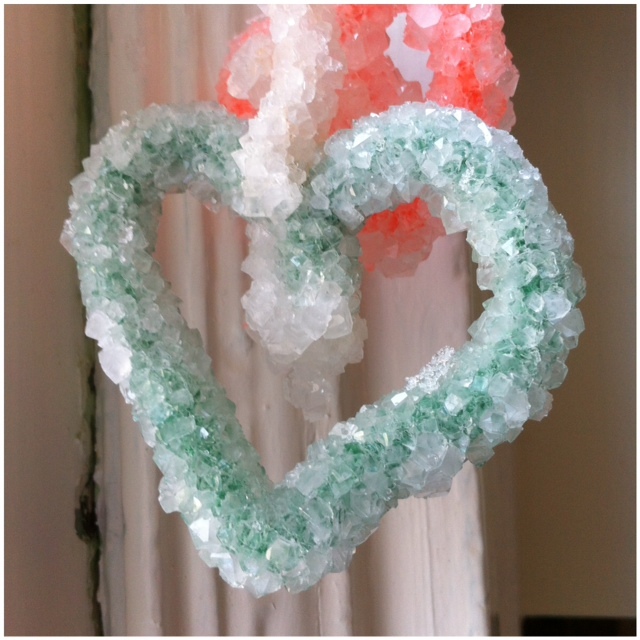 With Valentines coming up we decided to grow our crystals in the shape of a heart and started out by making pipe cleaners into a heart shape. While we were making our hearts, I set a teapot of water to boil. We then found two large mason jars and I tied the hearts to a pencil with a piece of string and set them to dangle in the jar so that they were not touching the sides. I then poured 3 cups of boiling water into a measuring cup and the girls helped me add 9 tablespoons of Borax (if you don't have borax your can get it in the laundry detergent aisle at most stores.) The ratio I had read was 3 tablespoons per cup of water and that seemed to work really well. After adding each tablespoon we stirred the water to dissolve the Borax. This step was really important in getting this to work. 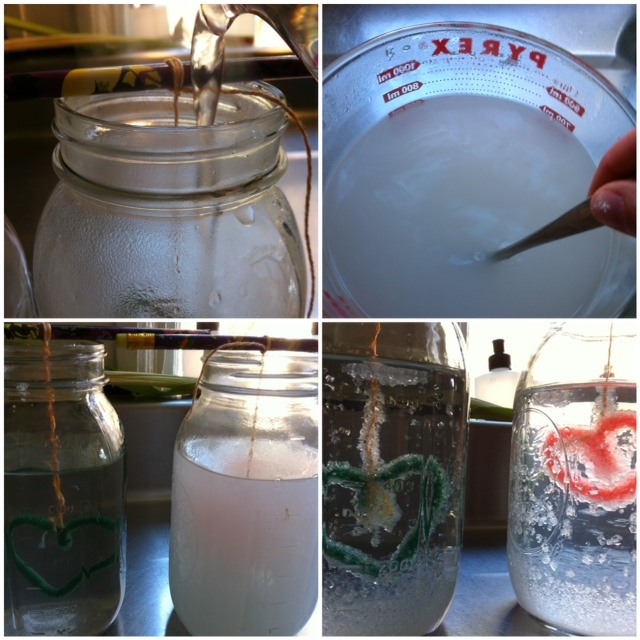 Once we had mixed in all the borax we poured the 3 cups of Borax and water into the jar. We made a few jars and then let them sit on the counter to cool overnight. Within just a few hours we could see the crystals starting to grow on the hearts. It was truly amazing and so cool to watch. 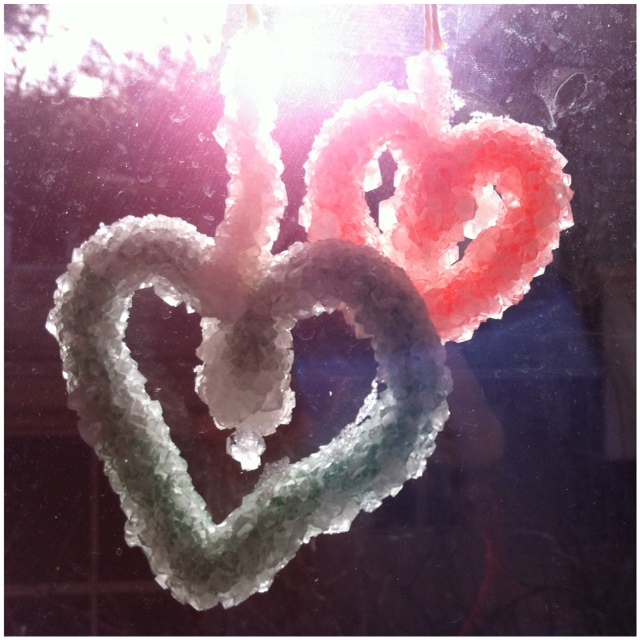 The science behind it is that the hot water dissolve the Borax and as it cools the Borax clumps to create crystals. After one night we took out our hearts and let them dry. I was surprised by how hearty the crystals were, since we had to do a little jiggling to get them out of the jars. After drying a little we have hung our crystals in the window. They looks so nice and the girls are so excited that they made them themselves. Welcome to Badash Crystal, your online retail shop for crystal candle holders, scotch decanters, paperweights, crystal stemware, glass goblets and glass cylinder vases. Thanks so much for this tutorial! We made these as part of our Jewel unit for Kindergarten. It was fascinating to watch!